Looking into painting your cabinets yourself? It is a doable process that can have a professional looking result when you follow a few easy steps. Your paint choice is of the utmost importance. When considering color choices, remember to consider your appliances. You’ll want to go with a color that goes well with your appliances, either a similar color that will help them blend well or a complementary color that will help them pop—depending on the style you want to go with. Choosing a high-quality paint will also save you in the long run. Avoid chips and other damage by choosing a paint that will withstand repeated cleaning and general wear and tear. When preparing to paint, you’ll need to remove the cabinets and all the hardware from your cupboards. Remove all hinges, screws, knobs, magnets, etc., so that you can work with a clean slate. Once removed, clean and organize your hardware. It is unlikely that you will have many other opportunities to clean your hardware, so take advantage now. Place the hardware in plastic bags and label them so that you know where to return them too. Tracking down and replacing hardware can be a headache, be sure to keep yours organized. Before you start painting, there is some prep work that will need to be done. Once your cabinets are removed, label them so that you know exactly where to return them and avoid any guessing games. Next, you’ll need to sand down the cabinets to a completely smooth surface. Using an electric sander will likely be the easiest way to speed up the process. Sandpaper can also be helpful to have on hand as you may want to do some light sanding between coats of priming and painting. Use a canvas drop cloth to set up a clean work area and avoid any spills, drips, or splatters from ruining your work area. A tack cloth may also be a helpful investment to remove any dust or debris from the cabinets and work area after sanding. Using an oil-based primer gives you very well adhered surface on which to paint. An oil based primer on hardwood is less likely to discolor painted white cabinets over time. If you’re painting with a darker hue, have your primer tinted to match your shade of paint. This will save you from needing to apply more coats. Apply light coats of paints to avoid any dripping. It may seem like a time-saving tactic to do heavier coats, but once drip marks occur you’ll need to sand them down and repaint. In the long run, doing thinner layers will benefit you. Don’t forget to consider the inside of the cabinet door and the shelves, you may want to paint them to match. Once everything is painted, apply a polyurethane topcoat for a little extra finish that will protect your cabinets from wear and tear. Make sure to give two weeks of drying time before reinstalling. When you are ready to reinstall, attach the hardware to the door first and then install the cabinet. 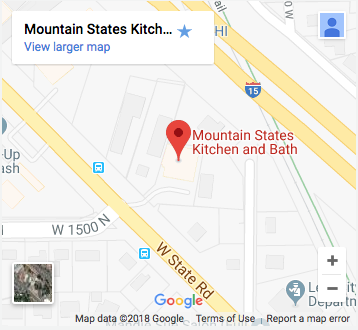 If you decide that DIY isn’t for you make sure you contact us at Mountain States Ktichen & Bath and we can create you some one of a kind, beautiful custom cabinets.